Mix 2 cups travelogue, 3 desert spoons cooking book and a teaspoon of how-to sailing guide and the result is the delightfully light and fluffy An Embarrassment of Mangoes: A Caribbean Interlude. The book details Ann and Steve Vanderhoof's journey aboard their 42-foot yacht Receta as they take a two year break from their professional careers to sail down the east coast of North America to the West Indies. Travelling more than 7,000 miles via 16 countries, this is a story that definitely requires cautionary labels as its guaranteed to make you wonder whether taking a similar sojourn yourself is required! 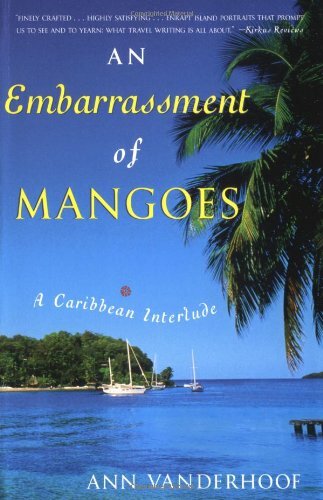 An Embarrassment of Mangoes is an entertaining read loaded with stories of their sailing experiences and the people they meet - both locals and cruisers alike as they navigate hurricanes, erupting volcanoes, carnivals and more than the odd rum distillery. Vanderhoof provides a flavour of the culture of each island that they visit and intertwines this with her culinary escapades as she immerses herself in the local people and their cuisine. The finished products are then written up as recipes at the back of each chapter for our consumption. Much like their own sailing experiences the book succeeds by not reaching too far. Content in what it is they are looking to achieve, we are left with an enjoyable read that is consumed with gusto and best served with a nicely aged rum accompanied by fresh breezes.